I have always thought wood was interesting and unique. 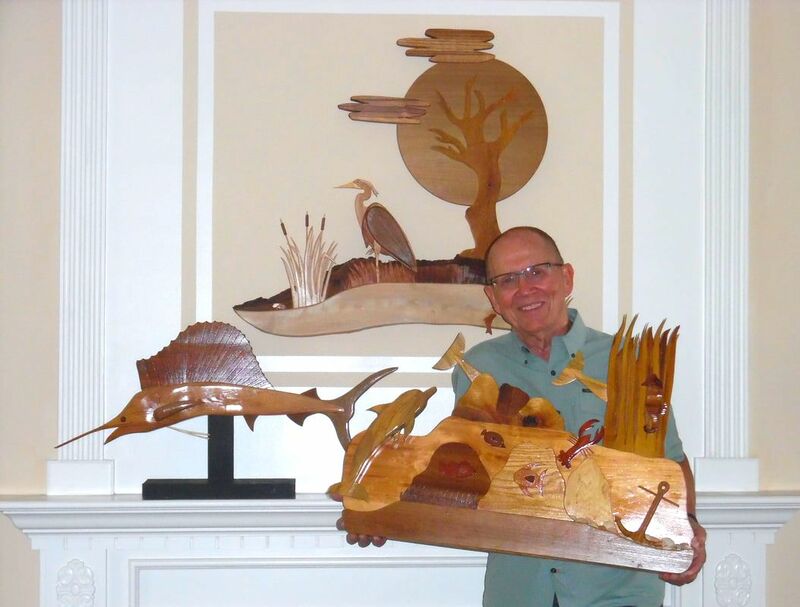 I have worked with wood for years, but my artistic work really started seven years ago when I moved to St. James and then retired. My main inspirations are nature, animals, and musical instruments. All of my work starts with an idea and then I create an original full size drawing in pencil. This first step goes back to my early days as a design draftsman and technical illustrator when paper, pencil, and pen and ink were only used! I then select types of wood for their various colors, textures and grain to give life to each piece. I do not use stain, but rely on each type of wood to add its own splash of color. Some of my favorite pieces of wood have a “raw edge” and/or bark. These add details for vegetation and landscapes. I also look for distinctive grain line to flow with the subject, such as gills on a swordfish, strings of a violin or tree bark. Sometimes things change from the original drawing, when choosing the wood for making each piece. I may find a piece of wood that lends itself to better represent part of the scene by adding more texture, color or depth, especially for my 3D pieces. For some of the smaller pieces I make templates from the drawing. I never strive to replicate nature and animals, but use my imagination to create an interpretation. I find it challenging and fulfilling drawing, then cutting, shaping, sanding and assembling the many wood pieces used to bring the work to life. In the end, when I am applying the clear finish, I thoroughly enjoy seeing all the different grains and textures light up to complete the finished work of art.